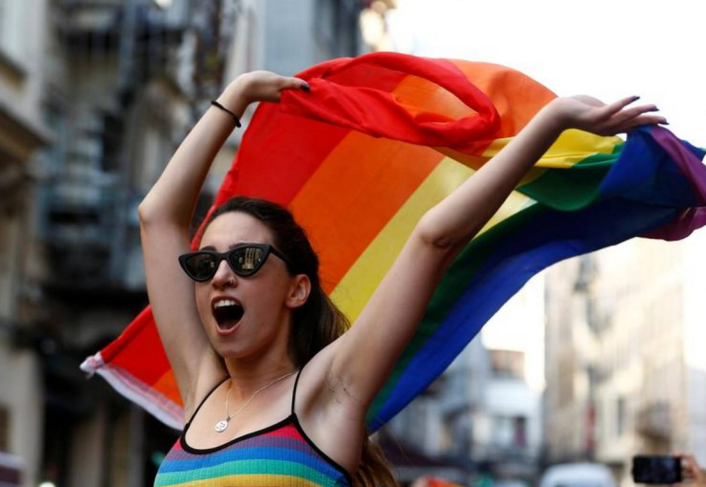 (Reuters) – Members of Istanbul’s [LGBT] community gathered for a rally on Sunday, instead of the annual Pride march, after they said the parade itself had been banned by the city’s governor for the third consecutive year. The march used to see tens of thousands of people parade down Istanbul’s main Istiklal Street, but Sunday’s rally drew a much smaller crowd. Just a few hundred people gathered on one of Beyoglu district’s side streets, waving rainbow flags and shouting slogans. The organisers said on Friday that Istanbul’s governor had banned the Pride march. “Like every year, we are here, on these streets. Our laughter, our exclamations, our slogans still echo in these streets,” organisers said in a statement read out during the rally. “We miss the marches attended by thousands where we celebrate our visibility. We make fun of those who try to place boundaries on us by the pride of our existence and the strength of our pride,” it said. Police dispersed the crowd following the statement, but some people continued walking through the streets in smaller groups. The Istanbul governor was unavailable for comment on Sunday. Istanbul has traditionally been seen as a relative[ly] safe haven by members of the gay community from elsewhere in the region, but although homosexuality is not a crime in Turkey, homophobia remains widespread. The Pride march has in recent years been the scene of clashes between police and demonstrators. There were fewer reports of such clashes during Sunday’s rally, despite police blocking roads and streets and trying to confine the crowd. Critics say President Tayyip Erdogan and his Islamist-rooted AK Party have shown little interest in expanding rights for minorities, gay people and women. Civil liberties in Turkey have become a particular concern for the West, after a crackdown under a state of emergency [was] declared following the attempted military coup of July 2016. Some 160,000 people have been detained, and nearly the same number of state employees dismissed, the United Nations said in March. Aside from the Pride marches in Istanbul and Ankara, LGBT movie-showings have recently been banned, with the authorities citing security reasons and public sensitivities.